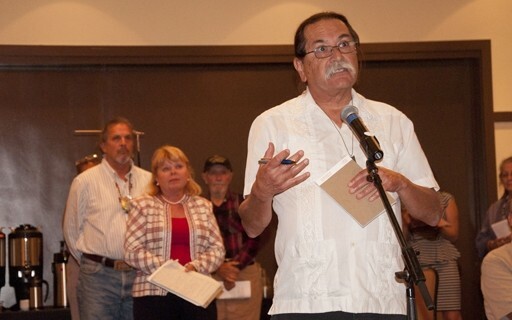 FIX IT: Marquez Sanchez speaks up at a Bureau of Indian Affairs meeting in Solvang. He said that every tribe has its own unique history and shouldn’t be judged by one template. Tracking ancestry and bloodlines is an über-methodical process. Throw government regulations into the mix, and proving that you are who you say you are is a potentially years-long endeavor. Decades, even. At a recent Bureau of Indian Affairs-hosted meeting in Solvang, emotions also showed up as a starring role in the process to gain official federal recognition for many Native American groups. Ramirez said the Ohlone Costanoan Esselen Nation completed its petition for recognition in 1995. She added that the Department of the Interior has to have information somewhere that the Ohlone Costanoans existed; it just needs to be found and accepted, rather than forgotten. Unfortunately, the process to gain recognition isn’t easy, cheap, or quick—so the Office of Federal Recognition in the Department of the Interior’s Bureau of Indian Affairs is proposing to change the rules. The meeting in Solvang was just a precursor to the process—a chance for the public and already established tribes to speak before the office gives notice of the proposed changes on the federal register. “Many citizens have criticized [the petition process] as broken,” Larry Roberts, Bureau of Indian Affairs deputy assistant secretary, said at the meeting. California has 79 Native American groups on the petition waiting list, all either in the process of being analyzed or waiting in line to start. The Salinan Tribe of Monterey and San Luis Obispo counties and the Coastal Band of Chumash, which has members from Ventura, Santa Barbara, and San Luis Obispo counties, are well-known local tribes waiting for federal recognition. The petitioning process was established in 1978, and it’s an intense one. A few of the requirements: Tribal members have to prove their bloodlines back to a full-blooded Native American. A certain percentage of the tribe’s members need to have continually lived on their ancestral land. Tribes have to prove, through documentation, that they’ve been meeting on a regular basis since 1900, and that the tribe has maintained political influence over its members from historical time until the present. At the Solvang meeting, Michael Cordero from the Coastal Band of Chumash said his tribe wanted to see changes to the federal regulations make the petitioning process easier. Chris Molina, a spokesperson for the Salinan Tribe, told New Times that the process is extremely stringent. The Salinan Tribe turned over a letter of intent—which signals that a tribe is beginning the petitioning process—to the government in 1995. After allocating time and resources, hiring genealogists and archeologists, and verifying everything that was found, the tribe turned in its completed petition in 2011. That said, tribal members worked on the document for much longer than 16 years. Only 17 tribes have been recognized through the petitioning process since 1978. There are literally hundreds of tribes across the country that aren’t considered official tribes by the federal government. Many of the groups are waiting for a positive affirmation that their tribe does exist, so they can gain the same benefits as a recognized tribe—which stem from a tribe’s right to self-determination. Official recognition by the government of the United States essentially gives a tribe, with or without land, the right of self-governance and the right to engage in government-to-government relations with the United States and other countries. Official tribes can also receive assistance from the Bureau of Indian Affairs through the Indian Child Welfare Act and the Housing Improvement Program. Although the Salinan Tribe and the Coastal Band of Chumash operate much like self-governing tribes with local governments, having the federal government’s stamp of approval will give them more of a leg to stand on, Molina said. “It will also give us the opportunity to be economically self-sufficient as a tribe,” he explained. Although some folks who spoke at the meeting said that easing the process to gain federal recognition would mean more casinos going up and more land being allocated to tribes, that’s not necessarily the case. Kevin Bearquiver from the bureau’s Pacific regional office told New Times that government recognition of a tribe guarantees its members the right to self-governance, allocations from Native American benefit programs, and certain ancestral rights. Bearquiver’s office works with 105 officially sanctioned tribes; there are 109 altogether in California. Bearquiver said California is kind of a special case because of its history with Native American tribes—and that history is another thing that makes the petitioning process so emotional for many tribal members. In the 1850s, at a time when many states were entering into treaties with tribes for land and federal recognition, Congress didn’t ratify California’s 18 treaties. Then, systematically, tribes were pinpointed and exterminated; some of those extermination missions were funded with federal money. Bearquiver said California’s gold rush had a lot to do with how Native Americans were treated in the state. Many speakers at the meeting in Solvang pointed to California’s history as one of genocide, separation, and a loss of ancestry. “We’re not defined, not accepted, don’t exist,” Josh Burner said at the meeting. The meeting was one of five to be held throughout the United States. A preliminary discussion draft of potential revisions can be found at bia.gov/WhoWeAre/AS-IA/Consultation/index.htm. Comments will be accepted until Aug. 16 via e-mail at consultation@bia.gov, or by mail to Office of Regulatory Affairs & Collaborative Action—Indian Affairs, 1849 C Street NW, MS 4141-MIB, Washington, DC 20240. Camillia Lanham is a staff writer for New Times’ sister paper, the Sun. She can be reached at clanham@santamariasun.com.